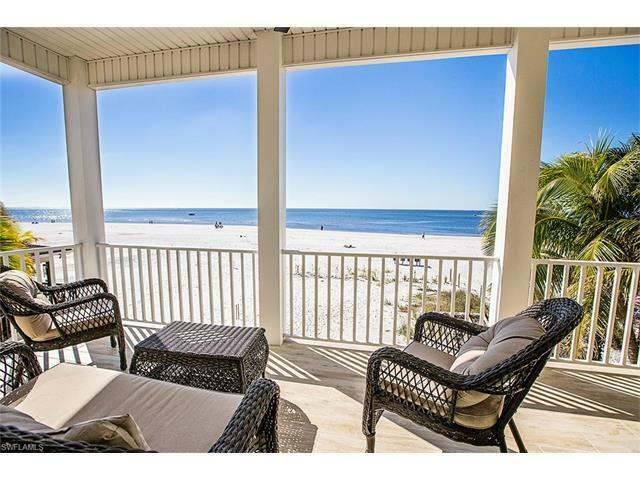 Enjoy spectacular panoramic views of the Gulf of Mexico and incredible sunsets from your brand new beach front home with private swimming pool! This fantastic property is located on the sought after north end of the island, just a short, less than half-a-mile stroll away from the Downtown and the Time Square! Or walk along the beach in the powder white sand and watch the seagulls and the pelicans! This home built by Woodland Custom Homes features 5 bedrooms on 2 levels, four of them en suite and every one of them with a private balcony offering breathtaking views of the Gulf. Four full bathrooms, private elevator, hurricane impact glass insulated windows, great kitchen with granite counter tops and stainless steel appliances, 2 separate A/C units and 1 year builders warranty. It comes turnkey furnished, don't miss this fantastic opportunity! © 2019 Bonita-Estero MLS All rights reserved. Information deemed to be reliable but not guaranteed. The data relating to real estate for sale on this website comes in part from the Broker Reciprocity Program. Real estate listings held by brokerage firms other than Luxury Waterfront Team are marked with the BR logo and detailed information about them includes the name of the listing brokers. Listing broker has attempted to offer accurate data, but buyers are advised to confirm all items. Information last updated on 2019-04-21.